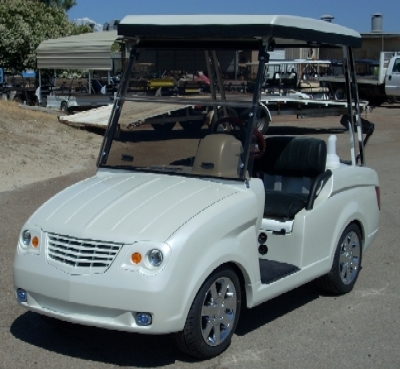 Once Western Golf Car had developed the Lido NEV product, it was important to update the basic golf car product line. This started with the top model called the Elegante. For this vehicle a completely new rolling chassis was selected for the basis of the car. 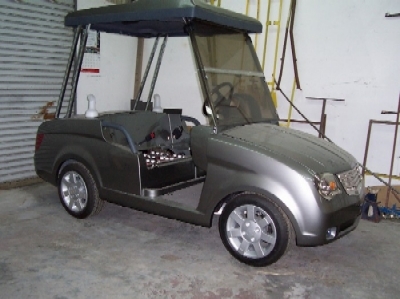 The body styling was done in the Formdesign studio and it was the most fresh and modern golf car I've yet seen. Using the new chassis required the design and development of new hardware for the battery and controller systems, body mounting brackets, seat belt brackets, as well as some structural parts for the frame. After getting these started I had to design other components such as foglight brackets, seat belt brackets, hinges, roof pillars, etc for the new body. All of these parts were supported by drawings which I used both in-house and with the various suppliers. A major new development for this car was the application of a newer style steering column from Delphi. I had prepared some groundwork for this column previously during the development of the Lido vehicle although it had not been yet used in production. The main benefit of using this column was the incorporation of the horn button on the steering wheel. Because these vehicles did not use chassis ground, the typical horn grounding circuit of steering columns could not be used. I was able to solve this with the later style column by using the SRS circuit built into the column. Of course I had to design completely new main and motor controller wire harnesses. A later development was utilizing an on-board charger in which the supplier was in the final stages of incorporating a DC-DC converter. This allowed the stand-alone DC-DC converter to be deleted and simplified the wiring somewhat. For this vehicle we decided to build the wire harnesses completely in-house, so in addition to the drawings I prepared tooling to build the harnesses. For production I designed completely new tooling to assemble the frame, body jigs to ensure consistent and correct fit of the bodies to the chassis, as well as the jigs to fabricate the various brackets, battery trays, etc. Although we had in-house welding fabrication capability, I always designed many parts in sheet metal where it was effective, and used the resources of the local job shop. Since the new frame was made of aluminum, I specified this material for many of the small brackets. Here are the new chassis frame rails on the assembly jig I designed. The first rolling chassis used by the design studio can just be seen in the background. 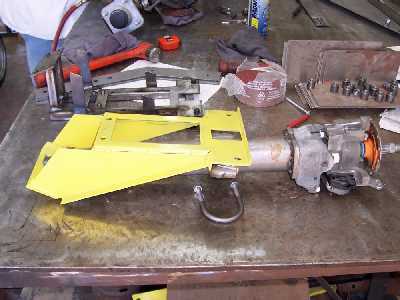 Here is the 2nd prototype steering column bracket. I based the design on using formed sheetmetal pieces. The 1st prototype was fabricated by welding hot rolled stock and it was used to confirm the dimensions and fit in the car. The sheetmetal design then proceeded from that. The core of the Delphi steering column can be seen. Without the plastic trim parts it's like a wet bird - pretty skinny. The plastic parts were destroyed in the process of getting molds off of the clay model in the design studio. 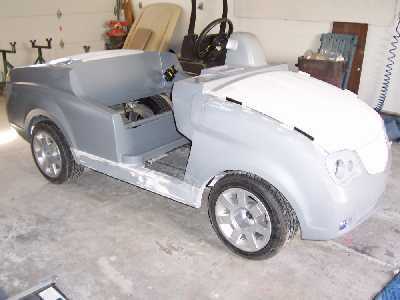 This is the 1st prototype car under construction. Fitting the body sections to the chassis was always a focus of my development work. I developed a system on the Lido project to pre-drill the bodies to fit pre-arranged mounting holes on the chassis. The holes in the chassis were pinned in the weldling jig. 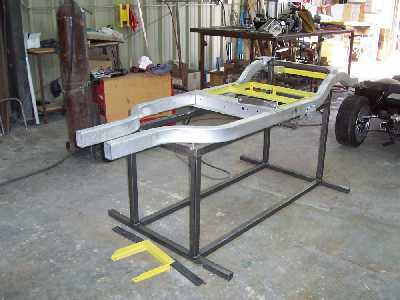 This ensured the proper and consistent alignment of the body to the chassis, and simplifed the assembly in production. We called the instrument binnacle the "conning tower" for obvious reasons. However, in the context of the assembled vehicle it didn't stand out visually, and was very practical and convenient to use. It was well received by all who saw the car. The body sections for this car as for many of the production cars were made by Prototype Concepts and were always of excellent quality. 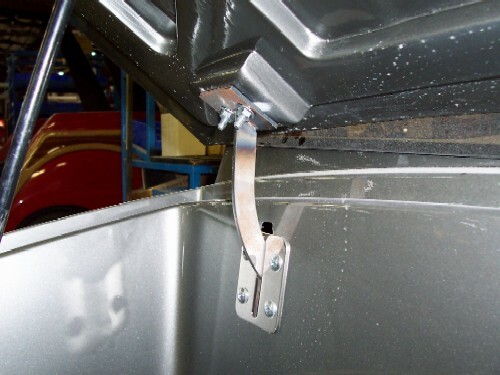 This is a close-up of the hood hinge in development. One of my early nicknames at Western was "Hinge-ineer" because I could design hinges for hoods and tailgates that actually worked. They were absolutely amazed when I did the first hinge for the tailgate of the Lido runabout and it worked the first time. This was on a Saturday and one guy actually called me at home to tell me "It works! ", he was so impressed. No one there previously had been able to do such a thing. I think Rongineer sounds better, though. 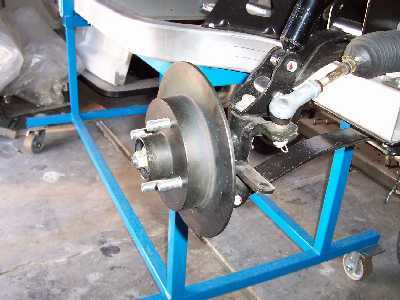 In anticpation of needing four wheel brakes for the car, I started development of front hydraulic brakes. This is the Lido rotor/hub which I found a way to adapt to the front spindle of the new chassis. Not seen is the mounting of the master cylinder which required designing a special bracket and linkage. This is the prototype nearing completion.